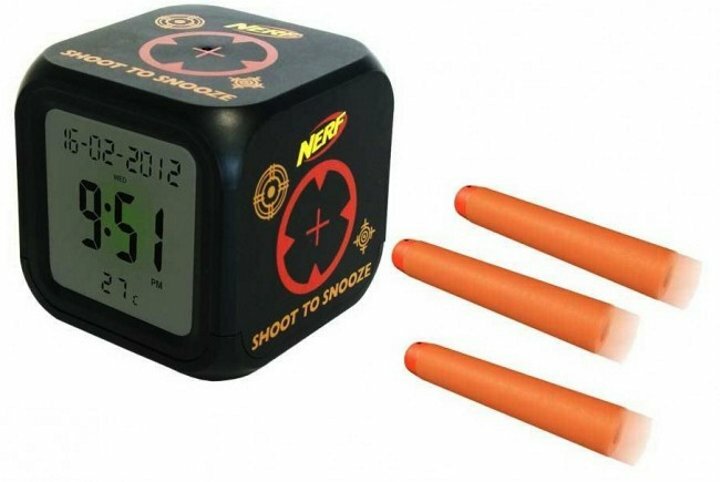 Shoot to Snooze Alarm Clock Sleeps Only When You Hit the Bullseye | OhGizmo! Alarm clocks are the bane of many people’s existence. They’re sometimes noisy and always annoying, but unfortunately, you still need them to help you wake up in the mornings. So why not make it a bit more fun with the Shoot to Snooze alarm clock? It’s the funnest way to wake up and it might even get rid of your weekday-morning blues. It also gives you an excuse why you need to keep your trust Nerf gun hidden under your pillow. The Shoot to Snooze alarm clock looks just like your average clock, but instead of having a big, old snooze button on top, it’s got targets printed on each face. Hit that target using Nerf darts (or any random object that you think will do the trick, for that matter) and it’ll give you a couple of minutes to snooze away. But if you’re a poor shot, then you’re probably better off with something like the Mr. Bump Alarm Clock. It’s available for £14.99 (about $24).